Preheat the oven to 180°C/350°F; line twelve ½-cup (120ml) capacity muffin pans with paper cases. Sift flour and baking powder into a large bowl. Add the sugar and salt and stir to combine. Set aside. Place the yogurt, eggs, oil and lemon zest in a bowl and whisk until smooth. Add the yogurt mixture and carrot to the flour mixture and whisk just until combined – use a fork to mix and do not overmix; the batter is supposed to be lumpy. Spoon the batter into the prepared cases and bake for 20-25 minutes or until golden and cooked when tested with a skewer. I thought of you last night as I spent a lazy evening browsing through old DH mags. I'm going to try to bake something pretty like you do! Sorry about your cake, Patricia, but your carrot muffins more than make up for it! Congratulations on your published thoughts! Congrats on getting published! How exciting! 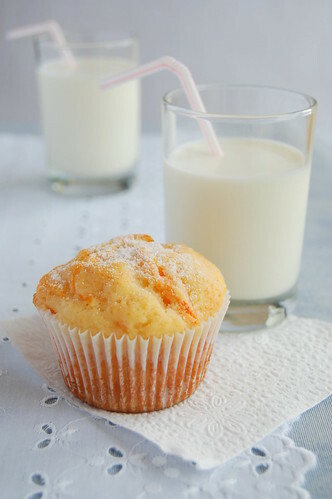 Your carrot muffins look so cute! I love the streak of carrot orange across the top! Yum!! Beautiful pictures, I love the muffins sitting there with the glasses of milk. I am sorry for your cake! I hate it when something bad happens to meals I cook or to my baking. Perfect muffins!! I love carrot anything and I'm receiving so many in my CSA share lately. These muffins look perfect. I make carrot cake but have never made carrot muffins. Sounds like a great idea! Thanks for the recipe. A must try. How great is that movie? I've seen it four times already! 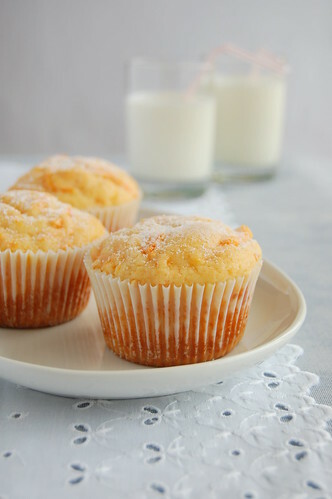 I love these muffins, so much better than baking a huge carrot cake. I like the fact that you use yoghurt in the batter. Peggy, tks for stopping by! Kelly, thank you! They turned out really good, and simple at the same time. Natalie, thank you for your support, dear! Sorry about your cupcakes. It's rather frustrating, isn't it? Alicia, I'm back - and tks for your support, dearie! Kickpleat, carrots are delicious in just about anything, don't you think? Farida, I've made lots of carrot cakes but these were the first carrot muffins, too! Taste of Beirut, thank you - I love using yogurt in baking, it adds such a moist touch. So sad that the cake ended up on the floor! But the carrot muffins look amazing! these muffins are really nice. and i don't even like carrot cake. made them for a group i go to and everyone wanted the recipe. that's a first! so thank you. Katrina, thank YOU for letting me know how the recipe turned out - I'm so glad! I'm so glad to hear that you liked the muffins - thank YOU for letting me know how the recipe turned out for you!